Natural Resources staff helped CHESPAX (the county environmental education program) install a web cam to observe an osprey nest. The nest can be seen from the Cocktown Creek boardwalk at Kings Landing Park, as well as from the live Osprey Cam. The camera is solar powered, so may be off-line in early morning or after extend periods of cloudy or overcast weather. 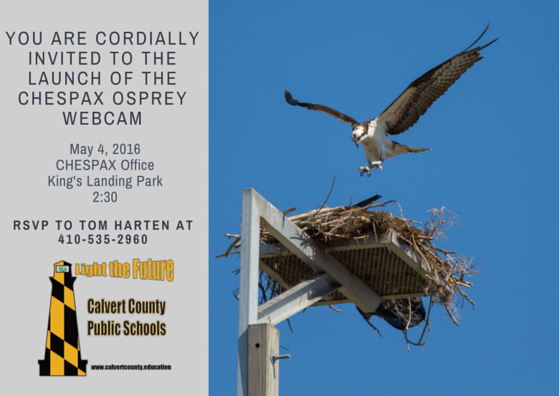 The Osprey Cam will be integrated into the seventh grade environmental curriculum on food webs and their canoe trip to survey SAVs in Cocktown Creek.